Need Some Goals? Visit Your HubTool This Week! Back in January we released some improvements to the HubTool that included visual tweaks and a more conveniently-located summary box. At the same time, we also introduced a feature that was only rolled out to 10% of Hubbers. Though still in beta form, we will be making this feature available to the community as a whole this week. The Need Some Goals box responds to the content of your Hub in real time, providing helpful feedback and giving you some insights into how you might add more depth and media to your Hub. 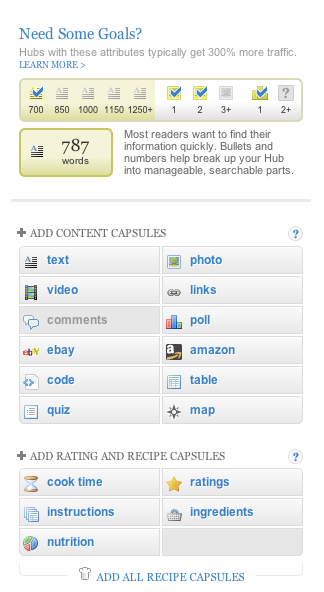 As you add more words, photos, and other capsules to your Hub, various icons in the box get checked off. The box also features written tips, quick links to Learning Center guides, and a display of your Hub’s current word count (something many, many Hubbers have been asking for). The numbers of words, images, and capsules we recommend are based on data we have regarding our top performing Hubs. You can learn more about how our research drove the design of this feature in the Learning Center. Hi Simone, I just published a new hub, and found the new features very helpful. I am new on HubPages, and my latest hub might be the best so far. Change the “?” symbol to “Cp” of “C” for capsules => ? is a bit obscure! Thanks for letting us know the “?” is not clear enough, John Anderson. We can look into improving that. We actually prefer that people use multiple Text Capsules over one Text Capsule with a bunch of H2 subheadings, so we probably won’t change that, but thanks also for the suggestion! Oh, just calling it a checklist sounds good. Thanks Sally!! I think that this extra tool is very helpful. Thanks! Awesome tool! Very helpful when editing existing hubs as well as writing new ones. Simone, congratulations! This is really a great feature. I’ve already adapted a few of my hubs according to your specs and the improvements are amazing. Thanks! Overall, I think the “Need Some Goals?” feature is great. I had never thought about the titles under my screenshots, photos & other images. When I was prompted by “Need Some Goals?” to use these titles to draw in readers, I went back through the hub I was writing and used richer and more appealing language. I’m going to go back through all my hubs and spice up the titles. Thanks for the great tip! I am so happy to hear it is making a difference for you, Marian Cates!